For more information on adoptions, see our Adopt Page. For an application, please click here. 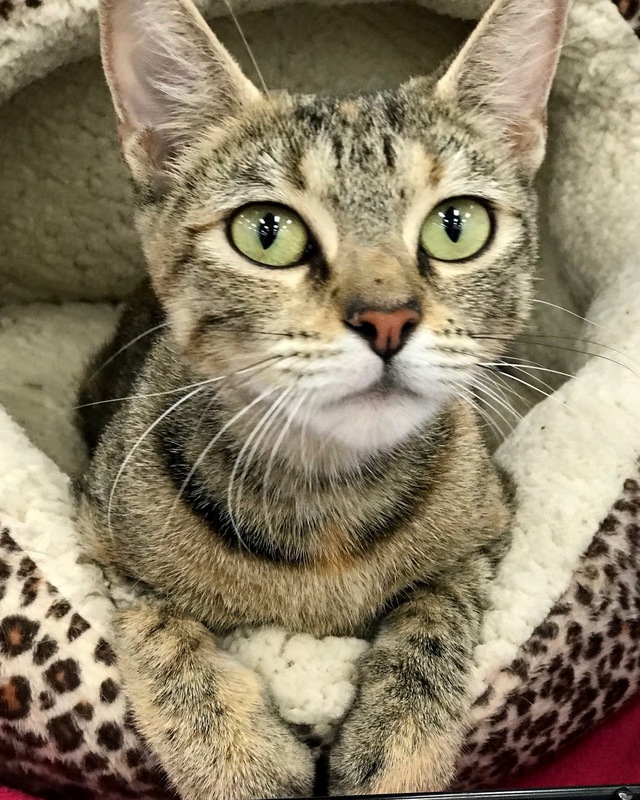 Fiona is a 1-year-old brown Tabby female kitty with intelligent green eyes. She is very people friendly and affectionate. She is engaging and quite playful. Fiona longs for a permanent home, either with another cat or by herself, and will get along with a gentle dog given proper introduction. She uses the litterbox dutifully, is healthy, spayed, and fully vaccinated. She tested negative for feline leukemia and FIV. You can meet Fiona and other cats and kittens on Sunday from 12:00 to 3:30 pm at Petco Great Hills. Please click here to contact Cats' Angels. Rocky is a 6-month-old Blue-point Siamese kitten. He is sweet and easy-going, and it doesn’t take him long to be comfortable with a new person. He purrs when you hold him and pet him. He is moderately active yet quite playful. Rocky gets along with other cats, has good litterbox habits, and he loves his canned food. He has been neutered and vaccinated, and he tested negative for feline leukemia and FIV. 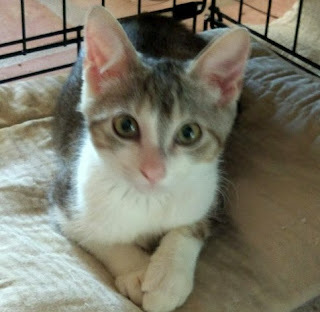 You can meet Rocky and other cats and kittens on Sunday from 12:00 to 3:30 pm at Petco Great Hills. 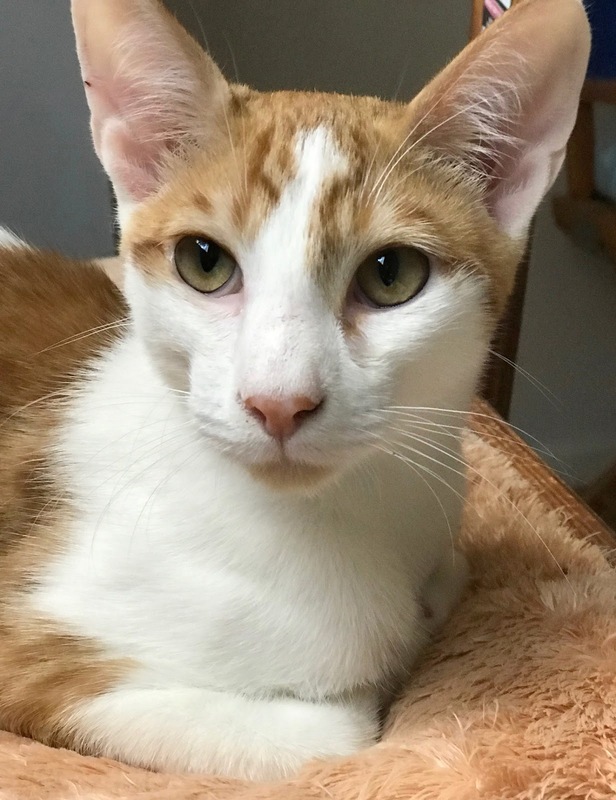 Monty is a 6-month-old Oriental Short Hair mixed male. His coat is mostly white, with orange tabby markings. He is gentle and affectionate, and his purr motor turns on as soon as you hold him or pet him. He is quite active and an agile acrobat. Monty has good litterbox habits, and he loves his canned cat food. He tested negative for feline leukemia and FIV, and has been neutered and vaccinated and is now waiting for his forever home. You can meet Monty on Sunday from 12:00 to 3:30 pm at Petco Great Hills. Sasha is a 4-month-old female kitten, white with classic tabby markings. She is shy at first but engaging and trusting once she is familiar with her environment. She has a loud purr when you pet her or just look at her. She especially likes to have her tummy scratched. She is an active kitten who amuses herself with her toys. She tested negative for feline leukemia and FIV, has excellent litter box manners and is very healthy. Sasha has been spayed and receive her kitten shots. You can meet Sasha on Sunday from 12:00 to 3:30 pm at Petco Great Hills. Josie is a 7-month old black and white Tuxedo female. Although shy at first, Josie is in fact very people friendly and affectionate. She is moderately active yet quite playful. 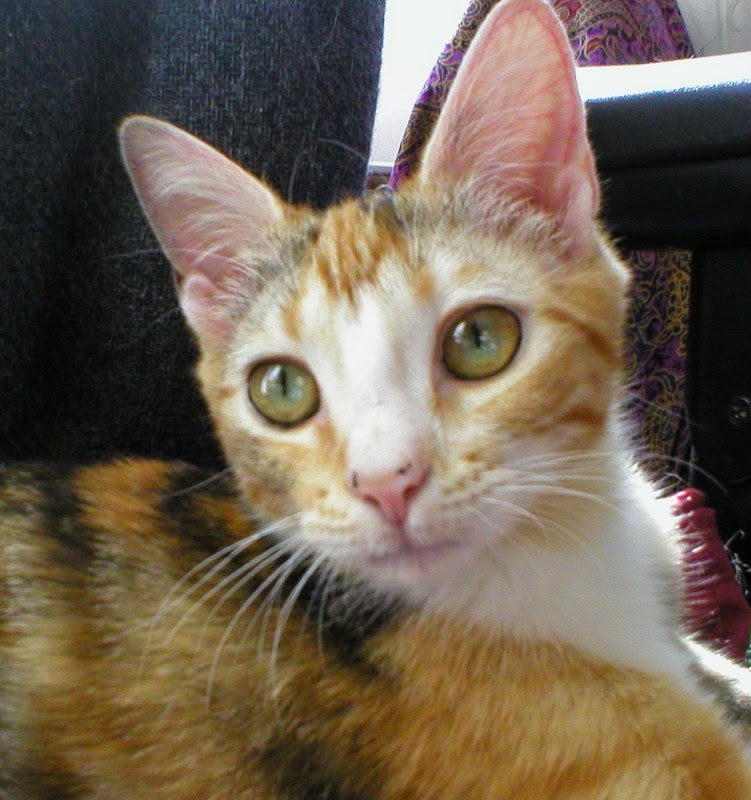 She will do well in a quiet home and will get along with another calm cat or a gentle dog. She uses the litterbox dutifully, is healthy, and fully vaccinated. She is spayed and tested negative for feline leukemia and FIV. Danica is a 5-month old blue Tuxedo female kitty. This precious girl has a gorgeous blue/grey coat with a white mask and white bib. She loves to play and cuddle with other kittens. On the shy side initially, she has adjusted well to her foster home and is becoming more trusting every day. Danica has very good litter box manners. She will thrive in a quiet home by herself or with another kitten or cat. All Cats' Angels kitties are healthy, neutered, tested for feline leukemia and FIV, vaccinated and microchipped. Pippin is a 3-year old brown Tabby male with beautiful tiger stripes and a soft short hair coat. He is a cool kitty; he sits next to my computer or on my lap while I type, and at night he lies down next to me and makes biscuits. Playful, his favorite game is the feather wand. he can jump really high to catch the feather. Active, easy going, moderately outgoing, Pippin gets first prize for being affectionate and he loves human company. He enjoys short brushing sessions and lets me clip his claws easily. At 12 lbs, he is a large but lean, athletic cat. He eats canned food and chicken hearts,and is generally a very sweet kitty. Pippin would do well as a single cat in a quiet household with a human who can give him a lot of attention. He is neutered and up to date on all shots. Zena is a 1 1/2 year old short hair Brown Tabby female. We found Zena as a stray kitten. We have been working on socializing her with humans, and she has made great progress with her foster mom but still doesn't trust new people. She loves to be petted around her neck and has a loud purr. Because of her lack of trust in people, Zena is considered a special needs kitty. She would do best in a quiet household with one or two adults, as an only cat or with another playful young cat. 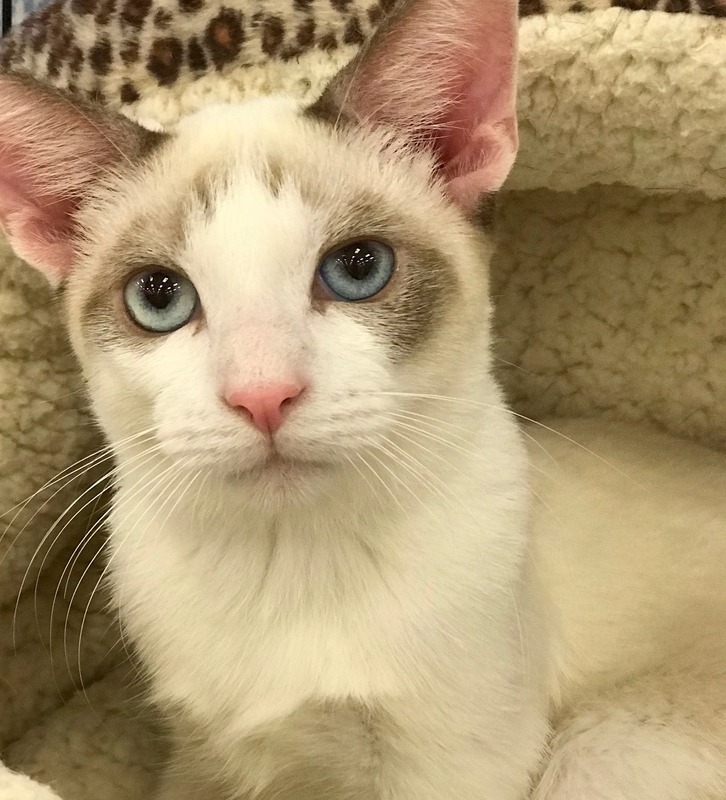 Zeke is a 1 1/2 year old Siamese male with gorgeous blue eyes. 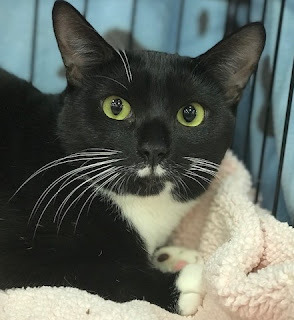 He is a handsome boy, very sweet and cuddly after he gets to know the person, but found as a feral kitten, Zeke still hides when he meets new people. He gets along well with all other kittens in his foster home. He is quite active and playful and loves his toys. Zeke would be a wonderful companion to another cat or kitten but hasn't had any close up experiences with dogs or children. A potential adopter should be aware that it will take some time for Zeke to adjust to a new home. Rosie is a sweet 5-year old calico girl. She loves sunbathing on her bed by the window--she also appreciates the bird bath and feeder outside and spends hours watching bird TV. But she won't hesitate to visit with other pets and supervise any keyboard activity without being a nuisance. She is affectionate, with a big purr, and she has a fondness for licking hands. She is great with other cats and dogs. She has perfect litter box habits, has been spayed, tested and vaccinated. She would be a great solo companion or a buddy for another kitty. A potential adopter should be aware that it will take some time for Rosie to adjust to a new home.